These Mushroom Egg Muffins are made in less than 30 minutes and are the perfect make-ahead breakfast. If you exercise in the morning I highly recommend eating a protein rich meal after and these are great to snack on after. 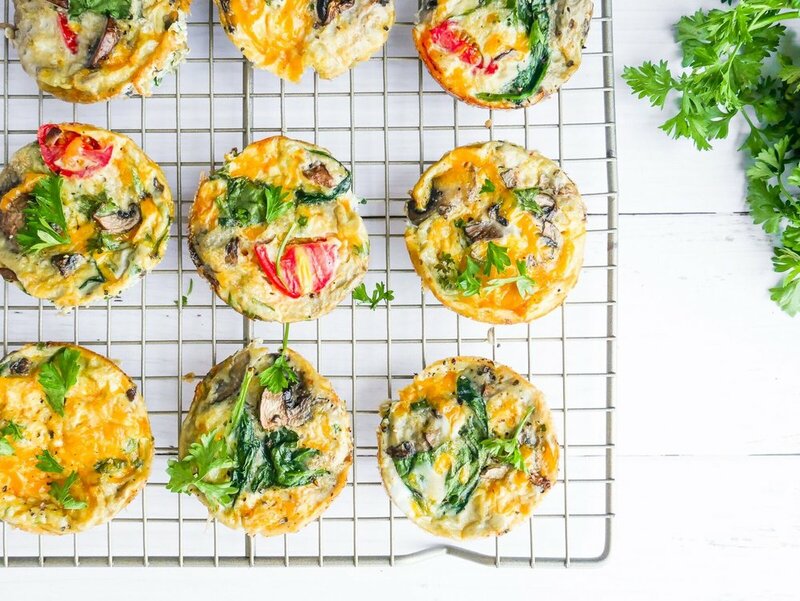 These muffins contain protein from the eggs and mushrooms, fats from the cheese and greens from the parsley and spinach. These will keep in the fridge for about 5 days in an airtight container. Healthy breakfasts all week… done! They’re great for school, work, or a quick bite on the go. For more great mushroom recipes, tips and serving suggestions follow 5 A Day on Facebook, Instagram and Twitter. Preheat oven to 180 degrees fan bake. Using olive oil or butter, grease muffin tray. In a skillet over medium-high heat, heat oil. Add mushrooms and 1/4 teaspoon salt and cook until softened and the mushrooms have released most of their liquid, about 5 minutes. In a bowl, whisk the eggs and the milk, add in the mushrooms, spinach, tomato, cheese, parsley and salt + pepper.